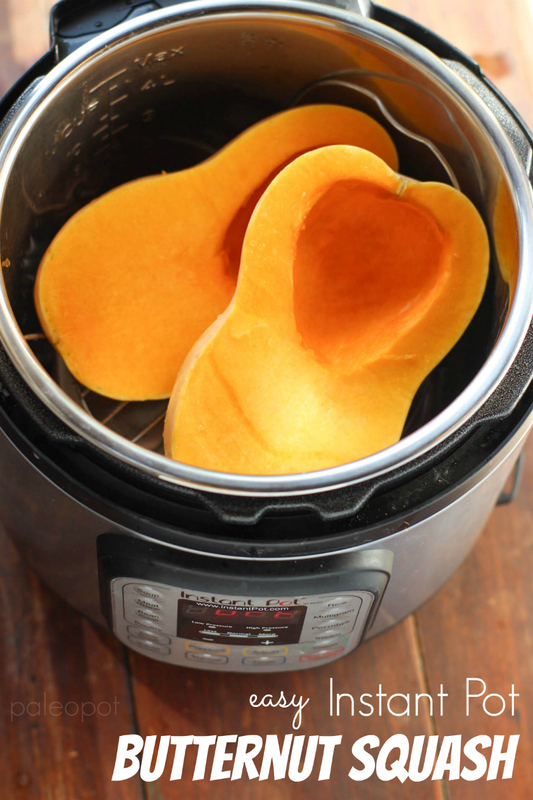 So you have a butternut squash you were thinking about cooking in your instant pot. Great! This post covers the different ways one could approach cooking a butternut squash in their instant pot. I wanted to see which method worked out best for me going forward, which led to me I cooking about 8 pounds of butternut squash in one weekend. It made for a nice freezer stash, and I learned a lot about how a butternut squash takes to an Instant Pot. Some potatoes or squashes peel easier than others. 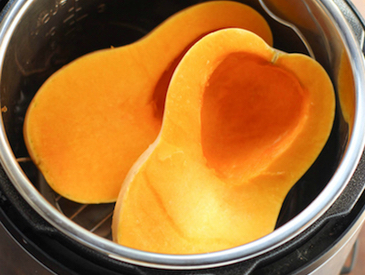 Sweet potatoes cook quite easily and allow their skins to peel right off, magically! 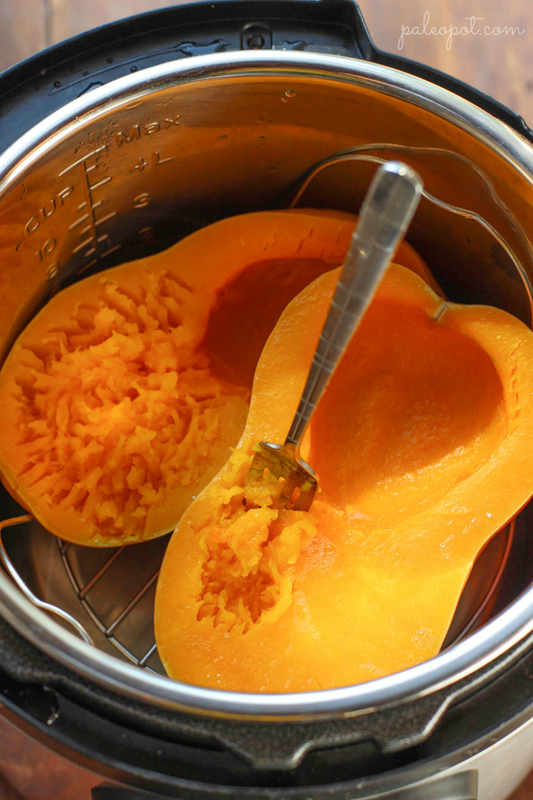 Spaghetti squash cooks in halves and lets you scoop the spaghetti strands out super easily, and even acorn squash cleans out of its shell easily when cooked in the Instant Pot, yet the butternut squash is different. The butternut skin isn’t ever going to come off that easy. I always end up having to finish cleaning the skin off with a paring knife, and you can lose some of the meat that way. Whole – This is by far the slowest and messiest option. Cooking it whole takes too long, and if you factor in the time spent removing the shell, you don’t save much, if any time vs peeling the squash before you cooked it. It simply does not save you the time it takes to cut a squash in half and clean it out. Cut into halves and cleaned out – This option is the quickest and easiest. About 25 minutes in the Instant Pot total [10 minutes to warm up to pressure, 12 minute cooking window, and a few minutes before quick releasing.] The skin still takes some effort to remove, again making the time spent removing the skin comparable to the time it would take to peel the squash in the first place. This recipe is for about 2 pounds of squash. 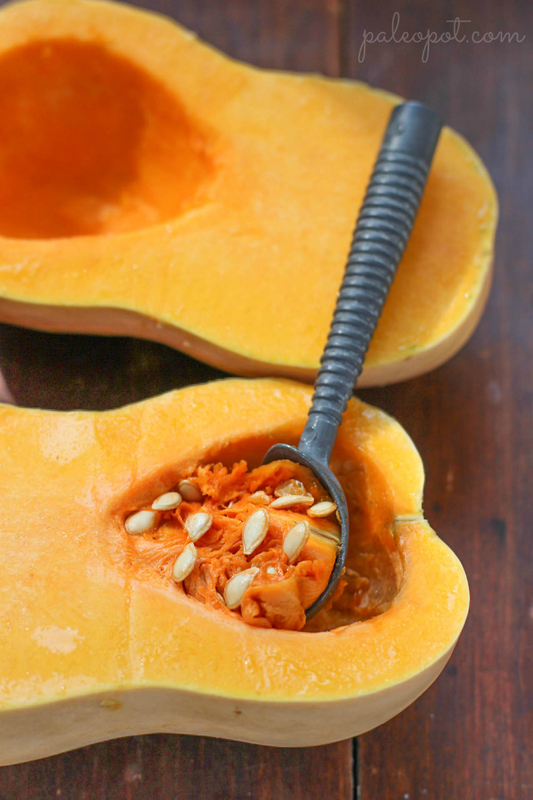 If any section of your squash is more than a few inches thick, it is going to require a few extra cooking minutes. If you decided to take the time to peel your halves, you can drop a couple minutes off of the cooking time. Peeled and cut into 1″ cubes – The quickest way to cook your squash, yet you do have to do the peeling and cutting. That is, unless you just happen to purchase those bags of pre-cut butternut squash 1″ cubes, that just happen to come in 2 pound bags. The recipe for the cubes only requires 6 to 8 minutes with a quick release. Remember that cooking times will vary slightly due to personal preference. I use an ice scream scoop to clean out my squash. 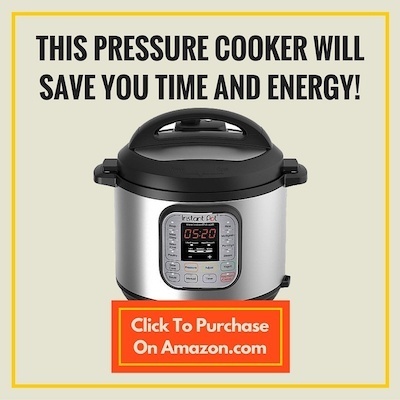 Instant Pot pressure cooker – I use the 6-Quart IP-DUO60 model. Butternut squash after cooking halves, removing shell, and slicing. 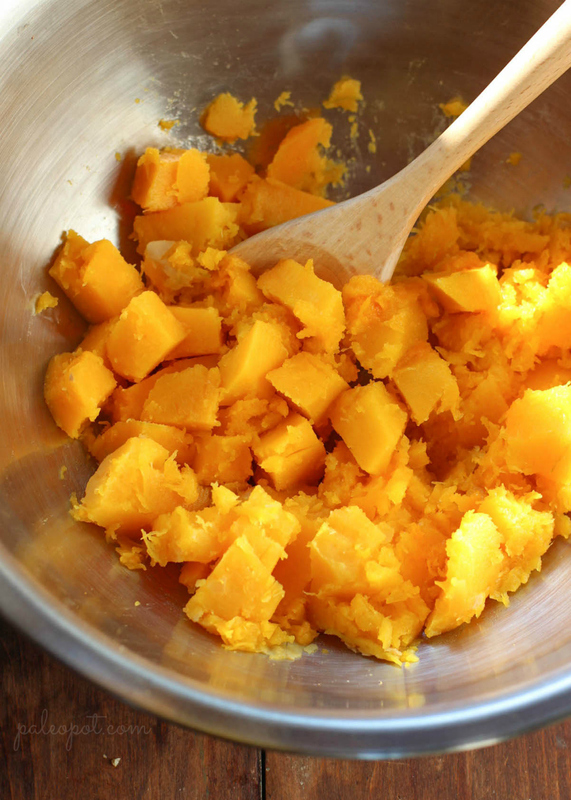 To cook peeled butternut squash 1" cubes, set your Instant Pot to manual for 6 minutes, and perform a quick release. This is the cooking time I recommend you start with, and you can always adjust the cooking time to personal preference. Thank you for including the “passive time” in your recipe! As a novice IP user, I have been thrown off by a few “quick” meals that did not factor this in and that I did not have the experience to consider. 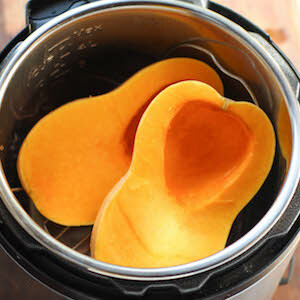 How much water for Easy Instant Pot halved Butternut Squash recipe? How much water for Easy Instant Pot halved Butternut Squash recipe? Sorry, I did not read the entire beginning of this page. Thank you. I’m a little confused about cooking the purchased 1″ cubes. It seems like it would be a mess getting them out of the cooker with the trivet in. I suppose I’m going to have to get a steam basket, because I love butternut squash and the starch fits in with my eating style. Thanks for the instructions. I love my Instant Pot; however for butternut squash, microwave is the best. The skin gets tougher so you can easily scoop out squash. Just cut in half and seed. Place cut side down in microwave safe container (I use 9×9 glass dish), cover with plastic wrap and cook approximately 10 minutes on high. Check by pushing on squash to see if soft. Be very careful removing plastic wrap, pick a corner away from you – steam is hot! First time squash cooker! Followed these directions and the skin peeled right off! So easy! Thank you!!! Microwave whole for 3 minutes and cuts in half easy. Thanks you for putting this in. I have been looking for how to cook butternut squash. All I have been getting was recipes. I just wanted to cook the butternut squash by itself. Thanks again. Do you put the cubes directly into the IP with water? They would fall through the trivet. But maybe with a steam basket? Tried cooking 12 minutes with chicken stock for more flavor, perfect! Thanks for letting me know it workout out! This worked perfectly! I did peel the butternut squash first using a large peeler and pushing it down and away. My son absolutely hates the smell when I cook squash in the microwave so this eliminates that issue! Glad it workout out for you!